Today I continued my journey into Enterprise and, as much as I'm excited about writing about these early episodes, I had to write about something entirely different tonight. Scott and I finally got back and settled in after our long trip back east but we're both still exhausted and really over-socialized. We really needed something to chill out with, something to help us calm down and make us laugh without too much pressure (ie- our full DVR or the million hundred episodes of Star Trek I have left.) 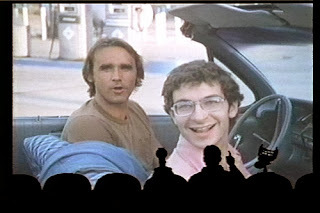 As a consequence, we ended up in a little MST3K marathon this evening. We ended up watching the last Comedy Central Era episode and was totally great. It was made even better by the fact that the host segments contained no less than FOUR Star Trek references. #1- While Crow freaks out in his best Scotty-esque Scottish brogue, Mike Nelson goes all Picard (tugs on his uniform and everything) and says, "Engage." #2- A NOMAD-like probe (called MONAD) invades the Satellite of Love and Mike and the bots kind of, sort of logic him out the backdoor. #3-Mike quotes Abraham Lincoln from The Savage Curtain when he says, "Help me, Spock. Spock!" A pretty stellar Janeway, actually. We watched this one a couple years ago but, after eleven months of intensive Trek viewing, the host segments made an even bigger impression on me. It was just what I needed. Tomorrow I'll get back to for-real blogging.